Description: Vigorous vine, to 50 feet long; leaves opposite or in whorls of 3-4, mostly oblanceolate to elliptic-oblong, to 4-6 inches long, short-acuminate, attenuate to a very short petiole; calyx lobes unequal, corolla bright yellow with a paler throat, to 5 inches across, narrowed below into a slender tube to 1 3/8 inches long and not swollen at base, lobes ovate), and broadly tapering to each end; wider than oblanceolate. ">obovate and rounded; capsule about 1.5 inches in diameter with spines about 3/8 inch long. 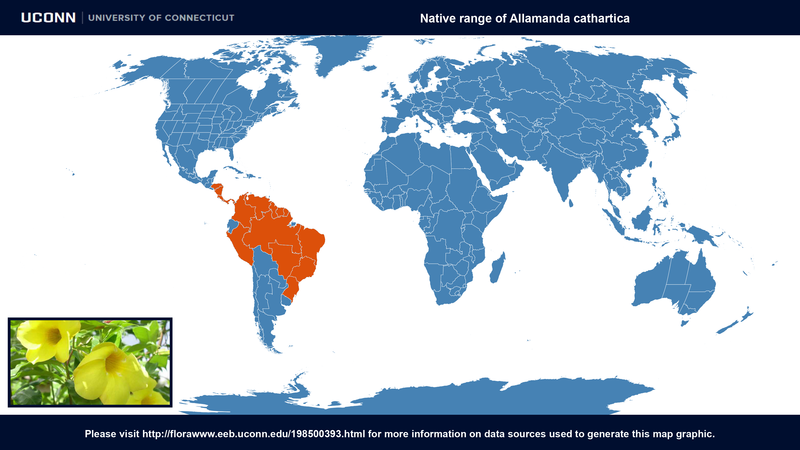 Probably from northern South America but now widespread. 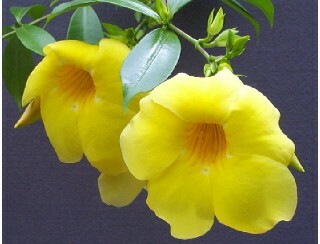 The name Allamanda comes from Dr. F. Allamanda, a professor of natural history in Leyden in the latter part of the 18th Century. All parts of the plant contain the iridoid lactone allamandin and may produce symptoms of vomiting or diarhea if ingested. 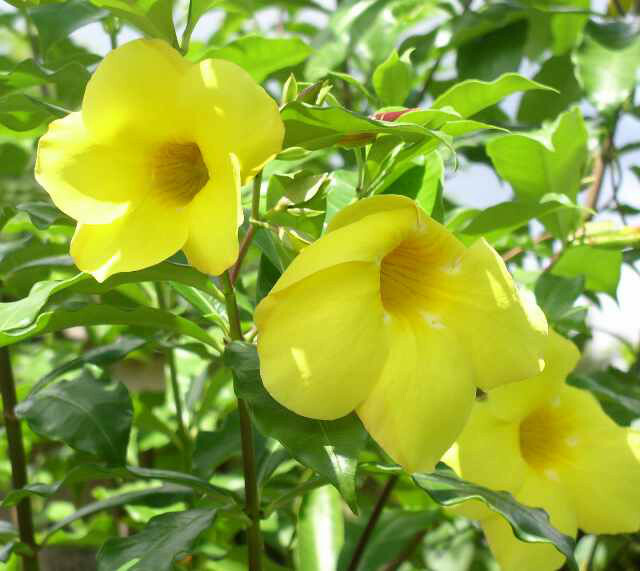 Uses: Allamanda cathartica is a wonderful example of a plant that is quite poisonous but also holds significant medicinal powers. 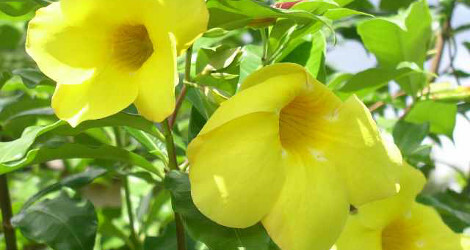 While studies have shown that the plant has notable laxative in effect">purgative effects, wound healing abilities, a reversible anti fertility effect, is an antidermatophytic, purgative effect, anti-proliferative effect, anti-microbial, cytotoxic, and a synergistic anti inflammatory effect when used with Piper nigrum. These medicinal effects are only when the plant material is used correctly, incorrect usage can easily result in toxicity. Image #00 (cropped) and #02 (original) by Ngocnk2 (Own work) [GFDL or CC BY-SA 3.0], via Wikimedia Commons. Last accessed on Friday, July 21, 2017.